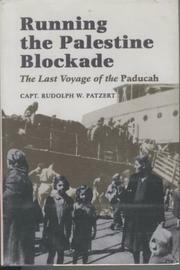  A riveting first book by Patzert, who was captain of one of ships that ran refugee European Jews into British-protected Palestine before Israeli independence; not just a sea story, but a moral adventure as well. Rudolph Patzert, a veteran seaman by the end of WW II, was looking for a ship to command. As he notes in the prologue, he had witnessed the anti-Semitism of the Nazis in Hamburg in 1934 as a young seaman. So, when asked to captain the Paducah, a converted gunboat bringing refugees from the DP camps of Europe to Palestine in May 1947, he had several good reasons for taking the assignment. He finds himself with a largely inexperienced crew and a balky, 45-year-old ship. But over the course of the voyage from Miami to New York, the Azores, Lisbon, the Mediterranean, the Black Sea, and finally to Bulgaria, where they take 1,388 refugees on board, the crew finds its sea legs and adjusts to the ship's idiosyncracies. And Patzert, a non-Jew, finds the reasons for his commitment to these battered, shattered people, survivors of the death camps and ghettos. When the ship reaches Palestine, all of its occupants are interned by the British, who attack the unarmed boat and its human cargo with dismaying ferocity; Patzert and his crew must masquerade as refugees themselves to avoid arrest. In the internment camps of Cyprus, he and his men share the horrid conditions inflicted on the already weak and weary Jews by the British Army, which only confirmed him in his conviction that the mission was just. Finally, he and some of his men are transferred to Palestine where they escape. In the book's epilogue, he tells what happened to some of them after Israel achieved independence. All of these events are recounted in a cool, measured prose that sweeps the reader along gently in its wake. Often exciting as an adventure tale, this is also a satisfying story of a modest man finding himself capable of the highest level of self-sacrifice.